For the 2010 Human Computing Christmas Party, we had a big Rock Band 3 party over at Casa Bickford. It wound up being the usual silly-good-time full of merriment, missed notes, and off-pitch singing, but the whole thing was nearly scrapped when my Sony Receiver apparently achieved sentience and tried to shut the party down. Yes, all those years it had spent dutifully processing sound for everything from Project Runway to Fallout had apparently given an ordinary Sony STR-DG510 stereo receiver the necessary input to achieve a sort of intelligence of its own. But, as Neil later theorized, it must have still have been bound by Asimov’s 1st Law of Robotics (“A robot may not injure a human being or, through inaction, allow a human being to come to harm.”). Thus, as several alcohol-energized partiers wielding plastic instruments were about to launch into Blondie’s “One Way or Another”, the receiver sprung into action and immediately abruptly cut off the sound, flashing a one-word message on its matte-black, minimalistic display: “PROTECT”. Stunned by this act of apparent free will on the part of a faithful piece of electronic equipment, we performed that most cherished of tech rituals: turning the power off and on. Once again the receiver was apparently back to its old dependable self…until the first guitar strum of the song. Then, as before, the sound suddenly muted and the Sony glared enigmatically at us, “PROTECT” flashing insistently on its display. “Oh, if only we had some engineers around who might be able to solve this…” I wailed in mock anguish. Knowing, of course, that this pretty much described half the attendees in our geekified little gathering. After a flurry of rewiring and patching, we soon managed to route around the troublesome receiver and kick into probably the most tragic rendition of Bohemian Rhapsody ever heard in our–or any other–reality. This feels way too familiar. On the day of the iPhone 4 pre-order launch, the company I’m contracting at was half shut down as all the tech staff spent the morning trying to get through to Apple’s ordering system so they could drop hundreds of dollars on a phone with tiny incremental improvements over the one they already had. Darn you, Apple, and your lovely, lovely toys! About a week ago, my 2-year-old Playstation 3 decided to take a dive, displaying the dreaded “red flashy light of death” which indicates an overheating problem of some sort. Unfortunately, nothing I could Google up led to a solution, and Sony indicated a repair price of $149 — exactly the market value of a two-year-old PS3. Regrettably, it was time for the old unit to go to that great game store in the sky, and I started looking around for its replacement. The good news is, the PlayStation 3 has been upgraded in recent times with a new “slim” model which is both quieter and far more power-efficient that the old one. (The original PS3 drew 118 watts when it was off!) So having to replace my old PS3 with a PS3 slim was not without its upside. Better yet, Black Friday was coming up , so I might be able to snag a couple of games for me, or presents for the kids in the process. Sites like Engadget did a great job of ferreting out everyone’s Black Friday deals, so I was well-versed in the various deals available by the time I was done with Thanksgiving dinner. Walmart (where I could get it with two cool games and a copy of Batman: The Dark Knight on Blu-ray) was the best deal for my needs, but the idea of braving the mad rush through those ginormous Walmart entranceways on the way back to the electronics section to snag the deal struck me as…well, suicidal. After considering other options, I decided it was Game Stop for me, where I could snag it with Little Big Planet and God of War 1 and 2–provided I was front of the line at 6 am when the store opened. After checking Amazon.com (my “go-to” retailer of choice) for the umpteenth time and finding no alternative, I went to bed and set two alarm clocks to rouse me at 3 AM so I’d definitely be ready. As I approached the local mall at 3:15, I saw numerous folks streaming out of the mall as I entered–not normally a good sign. It seems that Old Navy had been having a deal where they’d hand out wristbands letting you get a free copy of Lego Rock Band if you blew $20 at the store. It had occurred to me that I might grab Neil a couple of pairs of jeans at that price if the opportunity presented itself and score the game, but over 200 people in front of me had the same idea. 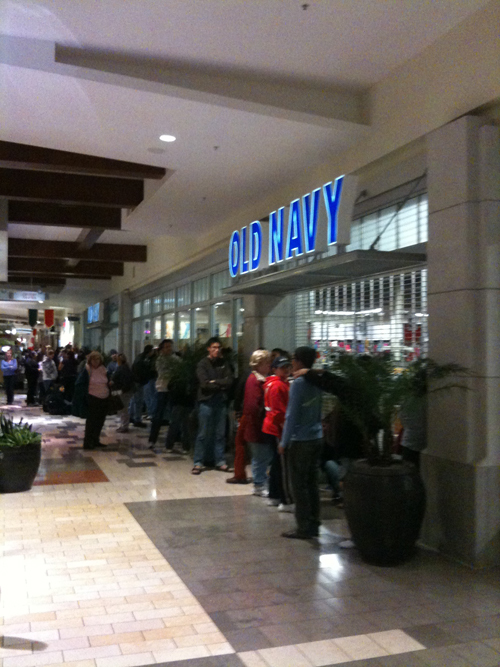 Old Navy, which was supposed to be handing out wrist bands at 3 am to the unspecified number of lucky few entitled to get the deal, was instead having their staffers hide out in their locked store–the opening time having extemporaneously been changed to 6 am when they figured out they didn’t have enough staff. Mall security, meanwhile, was gathered in a huddle looking both very young and very nervous. If not for the jovial mood of the crowd, it could quickly have become a very bad scene. “Eyes on the prize, Pete! Eyes on the prize!” I thought, and abandoned all thought of cheap jeans and Lego games to stand next to the deserted Game Stop doorway. There was just one other person in the vicinity, a painfully-shy-looking teen clutching a Nintendo DS and a very worn copy of a Pokemon guide. “You waiting on Game Stop?” I asked, to which he murmured and nodded affirmatively. “Umm… PS3… you know… The God of War thing…¨ he trailed off. “Cool.” I said, and I asked him what game he was playing on his DS. He cheered up a bit as he answered, and I guessed he didn’t run into too many 42 year-old gamers camping out at 3:40 in the morning to snag a deal on a new console. It was a rare inter-generational bonding moment brought on by a mutual love of bitchin’ graphics and on-screen explosions. As I settled in to kill time, I pulled out my iPhone and once again checked Amazon.com. Lo and behold, they had just posted their own special on the PS3 console, featuring the games Infamous and Killzone 2 (both of which I wanted), along with $10 off, no sales tax (a major consideration in 9.25% Santa Clara County), and free shipping! Blinking quickly to clear my eyes, I checked availability, added it to my cart, and got a confirmation in seconds. I then turned over to my newfound gamer buddy and pointed out the deal to him. He hesitated, but then decided to stick with his original plan, muttering something about really liking God of War). I wished him well and headed out of the mall, walking past the growing line of doomed-looking shoppers queued up outside the still-locked Old Navy. I posted a quick shot to Facebook, then went home and went to bed.